Travelling solo 2012: Kent with Alex and Viv - more cousins! Well, I left cold, windy and wet Barnsley on Saturday, and three trains later, arrived at Banbury where my cousins Tracey and Trish (Pat) picked me up at the station, and we had a quiet night in with Ray who whilst recovering well from his heart operation, had had a bad couple of days. He'd been out trimming his privet hedge, not an ideal task for an asthmatic. They'd been expecting rain, but it didn't eventuate. A brief reprieve, since it's been raining ever since! Our newly discovered mutual cousin Alex and his wife Viv arrived mid morning on Sunday, were introduced and Ray filled them in on much of our family history. Ray was the only other cousin who'd grown up in England, since the rest of the aunts and cousins were spread around the world. So now I was off on a new adventure, with yet another second cousin. Alex is a descendant of the youngest Reed sister Jessie. 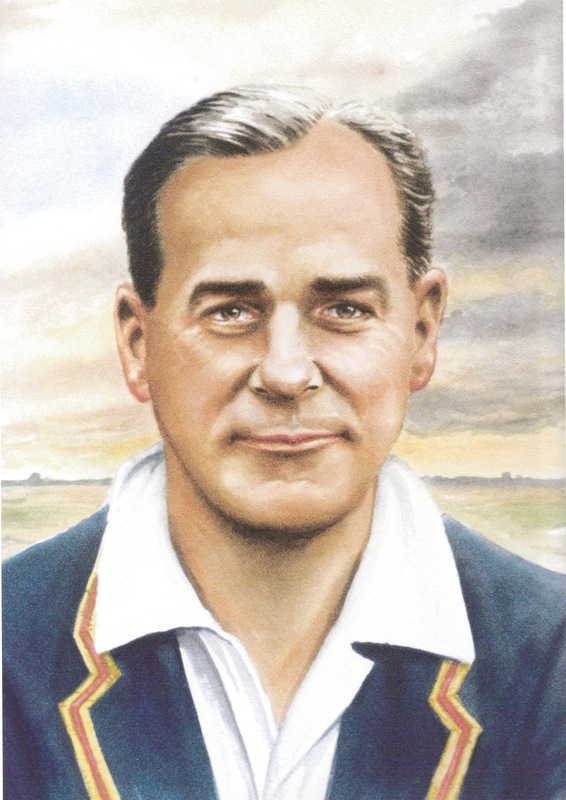 In 1910, she married a Hampshire and ultimate English test cricketer, Alexander Stuart Kennedy, and a daughter Mary (Mollie) Stuart Kennedy was born in our great grandfather's house in London Rd, Southampton. She was my dad's first cousin. My dad, being cricket mad, had always remembered that his aunt had married a professional cricketer. In the early 1920s, with Alex Kennedy coaching and playing test cricket for England in South Africa, the family moved to Cape Town. My dad saw his Aunt Jessie and cousin Mollie and new cousin Jean, a baby in Cape Town on his way to Australia by ship in 1925. At that stage, Jessie and Alex's marriage was breaking up, and Mollie was later taken back to England by her father, and had nothing to do with the family back in South Africa. 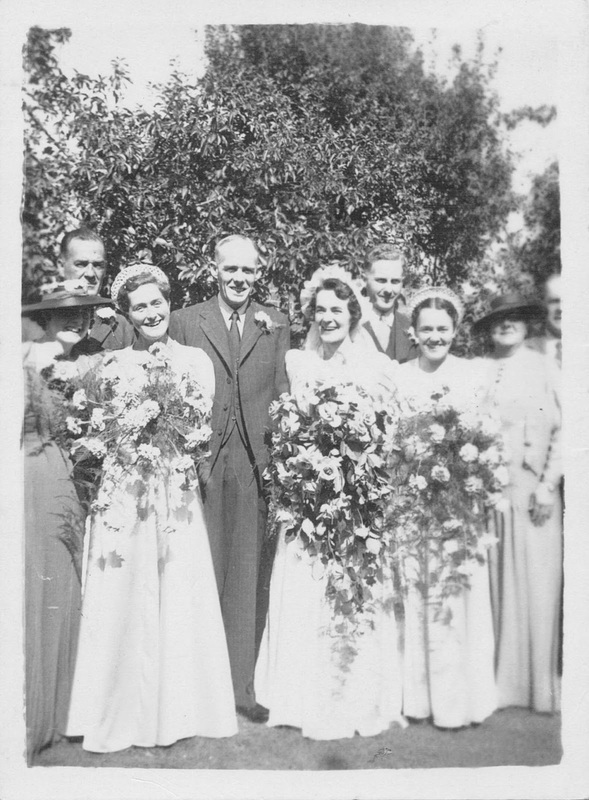 Mollie later married, and young Alex and his brother were born after the second world war. In 1962, Mollie died suddenly, having told Alex nothing about her life. Or the boys didn't remember! There were very few photos. Meanwhile, Jessie had remarried in Cape Town, had three more children besides young Jean (who had been given into the custody of her father Alex Kennedy, but remained with Jessie). They moved to Zimbabwe at some point, and their descendants are now scattered over at least three continents - Australia, Africa and Britain. Before I left Australia, I had sent Alex some photos that my "South African" second cousins had sent me. 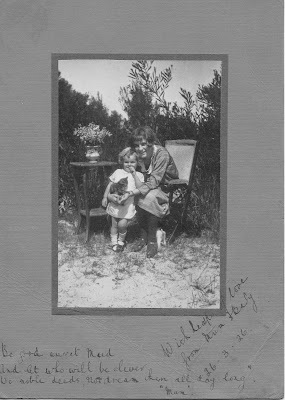 One was of his mother with young Jean, obviously taken not long before she came back to England. He was very touched by this, and we agreed to meet. He later suggested that I come and stay with them for a couple of nights in Kent, hence his drive up to Banbury, and our drive back to Kent, where I had a wonderful time. Alex and Viv live in a very small village near Sevenoaks, just 2-3 miles from Ightham where my mother's birth mother was born. We stopped on the way home at the Chaser Inn near Ightham for a very pleasant dinner, and then called in at Alex's local pub, The Golding Hop, which has one of the few remaining licences to brew their own cider. Eddie the publican was able to tell us where the Bewley Farm was - his pub was just around the corner from Bewley Lane. The reason I was interested in this was that Bewley Farm Ightham was the very place my great grandmother Annie Ashby, the daughter of Cornelius Palmer and Elizabeth Ashby was born. This is really strange because my ancestor Kate Elizabeth Palmer (my birth grandmother) and Alex shared the same surname! But no relation, since Alex's Palmer family comes from Southampton. The Bewley farm was obviously a big piece of land, because there is a Bewley Farmhouse, a Bewley Lane and a Bewley Lane house. No doubt, my ancestor was born in a long lost hovel on the farm. They were poor agricultural labourers. The following day - Monday - we set off after an early lunch for sightseeing in the rain. But that didn't matter much because the countryside is beautiful and we saw some magnificent buildings. First we went to St Peters Church, Ightham where my Palmer and Ashby ancestors were baptised, married (if they bothered) and buried. We stopped at Nut Tree House at Ightham. We then had a look at Soar Manor, a remarkably well preserved knight's house from 1290. But the highlight of our local tour was a visit to Ightham Mote, which I had thought was just a moat with some green fields. No such thing. It is "gobsmackingly magnificent" as I told the first guide I saw. It is managed by the National Trust. Here it is. 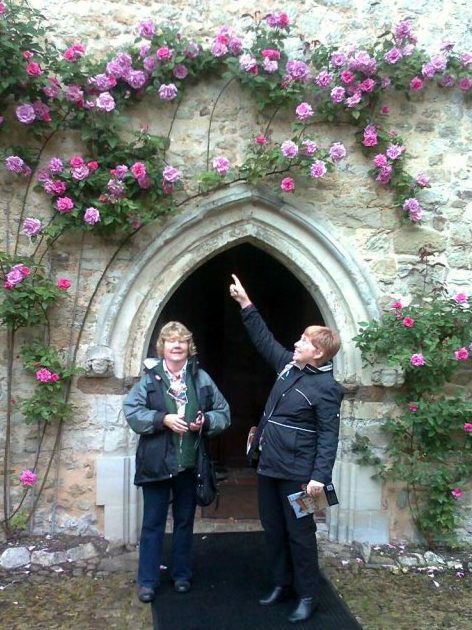 Viv and Margaret at Ightham Mote. Those Roses in the courtyard smelt just wonderful. We were able to see right through the house. It was built and restored over many centuries, and was owned by an American who loved all things English. He had never married and left the house to the nation. It has been extensively restored and is one of the few historic houses that pays its own way through entrance fees. After this Alex and Viv had arranged for the whole family - their son Simon, daughter Sarah and her two young sons - sports crazy Thomas (11) and William (9) to meet me over tea at the St Julian's Club at Sevenoaks. Another very pleasant evening indeed. This morning I slept in till 10 am! Alex and Viv had offered to drive me down to Angmering in Sussex where I was once again staying with Linda and Peter. (Linda is my cousin on my dad's side, and we share our maiden names.) So after a quiet morning and a good lunch, I said goodbye to beautiful Kent and we made our way south to Sussex. I'm sure I'll see Alex and Viv again one day - I certainly hope so. A lovely couple. And between us, we identified quite a few photos of Alex's mother Mollie. With heaps of love from Mum and baby. After this, mother, baby (Jean) and sweet maid (Mollie) were separated - forever. Ray Bayford told us the other day that Jessie, Mollie's mother visited his grandmother Alice in London sometime before her death in 1955 and he was introduced as a young boy. Whether she saw Mollie again, we'll never know. And now I'm able to catch up with my blog! Another great story and pics, Margaret! Thanks John. Still enjoying myself immensely, especially meeting up with people who are very dear to me, and making more friends. What a brilliant time you are having! How long did it take you to plan all this out? Not long to go now Marg so make the best of it. We will all be pleased to see you home safe and well and hear all your wonderful stories of family and friends.